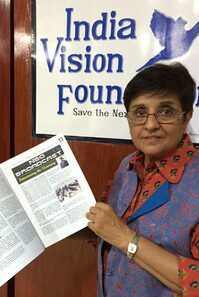 We started the journey of Wisdom Foundation's Namaste with an interview of Dr. Kiran Bedi to know about her NGO, "India Vision Foundation" which was featured in "NGO Broadcast" section for April 2016 edition. 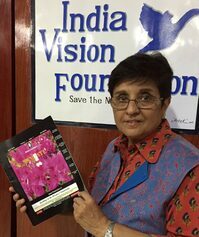 Wisdom Foundation has come up with the monthly English magazine, Wisdom Foundation's Namaste from April, 2016 to generate some much needed funds to help us with the cost of running our projects without having to appeal for funds especially during medical and legal emergencies like major surgeries and abuse cases. We work diligently to serve the community and the individual support from our well-wishers so far has been instrumental in making a difference in innumerable lives but unless we can provide the services consistently making a lasting impact is well near impossible. We are generating funds to support our projects through nominal philanthropic amount. Corporate /institutions/other service sectors have started a positive move by donating a small portion of their promotional and marketing budget by putting their company name, product/s, service/s as an advertisement on this magazine and making this magazine a success. Placing advertisement on this magazine, corporate, companies is not only supporting a cause but also achieving company's promotional objectives. Wisdom Foundation's Namaste features the most amazing pieces of work by different writers across India. It is the magazine of its kind at present providing writers a bigger platform to showcase their talents. * The section dedicated to the trending news about science across the globe is made available to many interested scientists and science enthusiasts in India. It is easy to get the hottest science news from across the globe at your doorstep monthly. * Wisdom Foundation's Namaste boosts the interest and promotes social awareness so that every Indian comes to know of their roles and we as a country become a role model for others. * The most important aspect of the magazine is however the educational section. It deals with educational information and opportunities both of which is a big headache for both students and the parents. There is no need of banging one's head anymore. Wisdom Foundation's Namaste brings to everything related to education and career. All you got to do is sit with your family, identify your passion and work towards it. * This is not it. The magazine contains a section dedicated to the sketchers, painters and the photographers who gets the opportunity to reach out to people and showcase their talents. The magazine gives them the opportunity to show their work to the entire country and get patronized by the section of art lovers and art consorts in India. * Another unique feature of the magazine is the job section. It presents the job seekers with multiple opportunities to try out in myriad fields. Job seeking just gets cooler and easier for everyone following Wisdom Foundation's Namaste. * The motivational section of the magazine provides the people of the nation with words of inspiration from people who have outdone themselves and left a blazing trail behind them for others to follow. The magazine guarantees you that your life shall change for the better after reading this section. * Good news for travel freaks! Wisdom Foundation's Namaste brings the most unchartered places on the subcontinent and the perfect time for chartering the terrains. One discovers new places in the places one already visited but never cared to explore in detail with this section. * One of the special features of the magazine is that it incorporates the work of various NGOs in India working tirelessly day in and day out to make a difference in the lives of others. All the magazine wants to send out to their readers through this section is the message that lives can be moulded for the better if we work together for the common cause of progress. * It also features a students' section where all the school students are encouraged to participate and get some social boosts giving their promising professional lives a head start. Their innovative work and ideas get noticed as the best lots are brought before the readers. Not only does it encourage the students but also the schools as their popularity increases based on the performance of the students. * Last but not the least; the magazine does contain the most important set of numbers which you might want to keep handy in case of emergencies.